School bus safety in India became a topic of discussion this republic day when a five-year-old boy was kidnapped by armed bikers in broad daylight from his school van. On the eve of Republic day, a five-year-old boy was kidnapped just as he was about to board his school bus in Delhi. Fresh reports now reveal that the abducted child has been rescued by the police. One of the kidnappers were shot dead during the shootout. With more and more Indian parents using the commute provided by the school for their kids, the incident once again points at school bus safety in India. School bus safety in India became a topic of discussion this republic day when a five-year-old boy was kidnapped by armed bikers in broad daylight. We must tell you that security was at an all-time high in the capital at that time due to Republic Day and the ASEAN summit. The five-year-old nursery student who was kidnapped by armed bikers from Delhi’s Dilshad Gardens. However, the armed bikers still breached security and kidnapped the boy. The child was about to board his school van in the east Delhi area at the time of the incident. There were 14 students on the bus when the armed bikers stopped the bus at Delhi’s Dilshad Garden area. The bikers, their faces obscured by helmets, held a gun to the driver’s head. They also threatened to shoot if anybody raised an alarm. Needless to say, the incident created a stir in the area. Parents were left shell-shocked. The kidnappers later called the parents on January 28 and demanded a ransom of 50 lakh rupees. The nursery student has been rescued by the police last evening. The kidnappers were tracked down to Sahibabad area of the notorious Ghaziabad. One of the main accused was shot dead in the shootout while two others were injured. 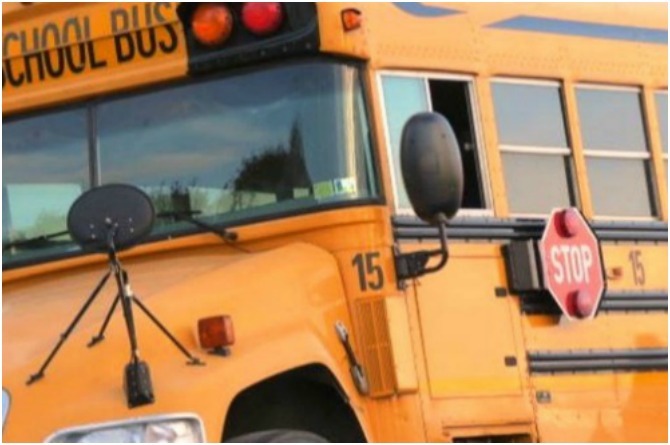 Does your child take the school bus? With kidnapping and security issues on the rise, school bus safety has become a cause of concern amongst Indian parents. However, there are many parents, especially in the metro cities of Mumbai and Delhi, who have no choice but to take the school bus option. While your child’s school would check everything for you, don’t hesitate to cross check everything. From the driver’s and bus caretaker’s identity cards to the bus driver’s licence, make sure that you ask the school to provide you with all the documents. If you plan to pick up and drop your child every day from the bus stop, make sure you maintain the routine unless you have an exigency. This would make sure that your child knows that it’s you who would pick him up every day and that it is not okay to walk away with anybody. As a parent, you have full authority to ask for the driver’s identity card or even the driver’s licence at any random point. If he doesn’t cooperate, inform the school. Also, while you would be seeing the driver and caretaker of the bus every day, make sure you are not over-friendly with them. Your child should know that even though you see them every day, they are still strangers. While it is advisable to be cautious, do not panic at every given moment. This would only scare your child. You should make your child feel that taking the school bus is a normal activity and not something to be worried about. These days all school buses have CCTV cameras installed. If need be, ask the school authorities to provide you with the footage. Also, do a random inspection of the bus your child takes every day. Make sure it contains all necessary equipment such as seat belts, fire extinguisher and first-aid box. It would also be wise to ask your child on the activities of the bus. This would be a step to save him from being bullied and general teasing. Report any unwanted behaviour to the school authorities. Newborns stolen and then smuggled in biscuit cartons in West Bengal!